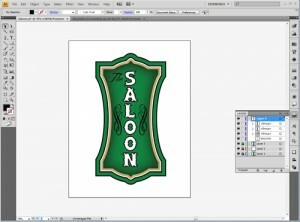 I’ve received several questions concerning the Wild West logo I created for Wild West Weeks. I created it from scratch (but not the fonts) using Illustrator for most of the heavy lifting and then some post-production work in Photoshop Extended. I have the CS4 version of both. Since I don’t have the history (I often discard the history from Illustrator and Photoshop to reduce the file size) from where I created the basic outline of the sign, I’ll make a new one. First, you need to decide on the orientation and then we can throw some basic shapes together. Or you could purchase some gorgeous panels from Letterhead Fonts (you can see where the American Panel 2 inspired my design). 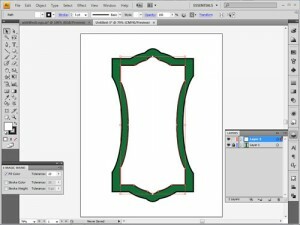 For this tutorial, I’m going to make a vertical panel. 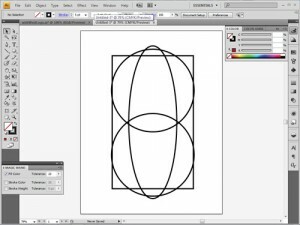 So I’ll start by throwing down a rectangle and then I’ll add a couple of circles and an oval (using the Rectangle & Ellipse tools). The stroke is 5 points and I’ve left the fill color as transparent so you can see the different shapes. Next, I pick a nice fill color, a medium green (I used #17823E, but you can select whatever you like), and I select all and then Unite (Pathfinder menu) the shapes into a single mass. Next, I’m going to draw a couple of ovals on either side and Minus (Pathfinder menu them from the compound shape. Now we’ll select the shape and Offset the path (Object > Path > Offset) by -20 pixels. I like to keep everything in separate layers, so I drag the new shape into a new layer and then set it’s fill to white. This step is nearly identical to step 3. Offset the path by -12 pixels. Then we’re going to pump the Stroke up to 10 and select a copper color (#C7A571) for it and a darker green color (#144221) for the fill. 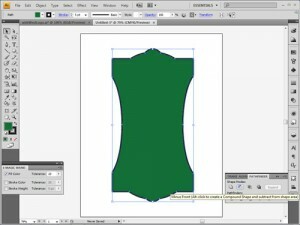 Now copy this new copper trimmed shape and Paste in Front (Edit). Set the stroke to empty and the fill to our original green color. 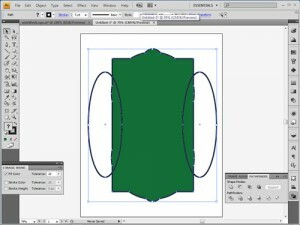 Now Feather (Effect > Illustrator Effects > Stylize) that fill 50 pixels. This creates that nice worn fade in the color. 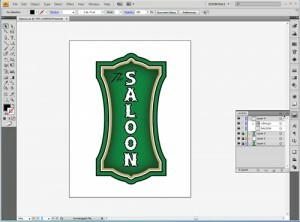 Now pick a couple of complimentary fonts and add your titling to one or more new layers. I’m using the Saloon and Billy Argel fonts from dafont. If you have issues with saving after using some fonts, try selecting the text and converting to outlines (Type > Create Outlines or Ctrl+Shift+O). Scrollwork, flourishes, hooladanders… whatever you call those decorative bits are next. Unfortunately, I didn’t make my own; I bought a couple of vector packs from Go Media Arsenal a when I was working on my degree which I put to use in the Wild West Weeks logo. 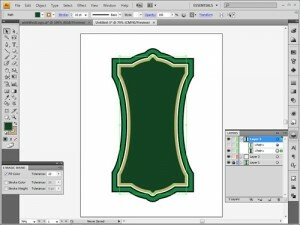 In this instance I’m using a free vector set from Free-Vectors.com. Though smart use of the Pen tool and it’s Bézier handles and then Reflecting copies would net the same result. Next time, I’ll bring the logo into Photoshop for post processing. Great lesson, complicated shapes can be easily created using simple shapes…wow..that’s so easy! Thanks a million.